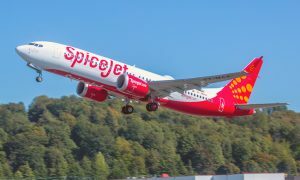 SpiceJet today launched its direct flight services to Dubai from the historic city of Amritsar with traditional flag-off and lamp-lighting ceremonies at Sri Guru Ram Das Jee International Airport. The flag-off ceremony, presided over by Mr. G P Gupta, Chief Administrative Officer & Accountable Manager, SpiceJet and Mr. V. Venkateswara Rao, Airport Director Sri Guru Ram Das Jee International Airport, Amritsar. Distinguished airport officials Mr. Balwinder Singh, Assistant Commissioner of Customs, Mr. Vishal Dubey, Commandant CISF and Mr. Gagan Malik, Project Head, Amritsar Airport and distinguished citizens of Amritsar also graced the occasion. In line with the aviation tradition to mark key milestones, SpiceJet’s Boeing 737NG aircraft deployed in this route was greeted with a grand water cannon salute on its arrival from Dubai. The launch was initiated by Mr. G P Gupta, Chief Administrative Officer & Accountable Manager, SpiceJet and Mr. V. Venkateswara Rao, Airport Director, with the customary lighting of the lamp which was then followed by the ribbon-cutting ceremony thereby marking the formal announcement of the launch of SpiceJet’s SG 55 Amritsar to Dubai flight. The ceremony finally came to a conclusion with Mr. V. Venkateswara Rao flagging-off the flight at 11.30 AM, thereby initiating a new chapter in SpiceJet’s international connectivity. Flights in this route will be operated on all days except Saturdays. Dubai is one of SpiceJet’s six international destinations – Dubai, Bangkok, Colombo, Kabul, Male (Maldives), and Muscat. 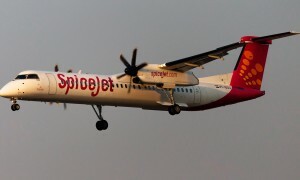 With the launch of these flights, SpiceJet will be serving Dubai direct from eight Indian cities: Delhi, Mumbai, Ahmedabad, Pune, Kochi, Madurai, Amritsar, and Kozhikode with connections from dozens of more cities including Kolkata, Chennai, Hyderabad, and Bengaluru.